Relics of the Sutton Coldfield of 1150. 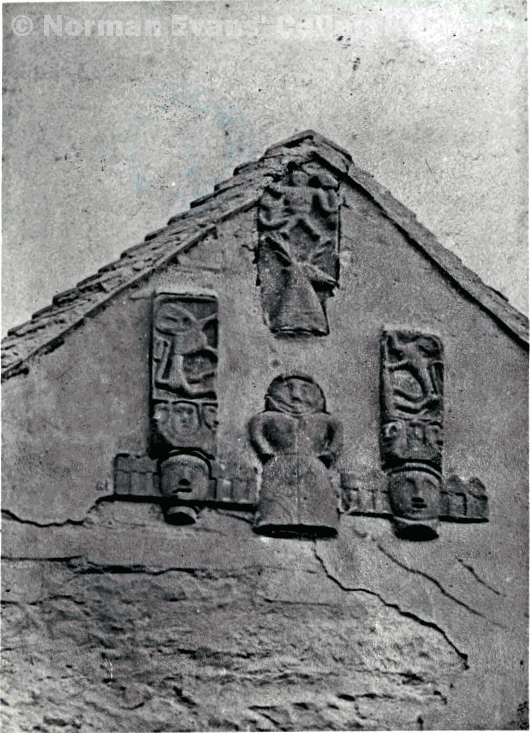 These stone carvings from the Chapel of St. Blaise were recovered from the old manor house and inserted in the gable of this building in High Street in the sixteenth century. The building was demolished in 1878, and the stones were removed to Sutton Churchyard -they are now in storage, and will possibly be destroyed. There is some evidence that Great Sutton (the part of Sutton centred on High Street) was a farming community in 1150 with two or three large open fields divided up into strips of land. Each farmer had ten or more half-acre strips in each field, paying rent to the lord of the manor. Whereabouts were these fields? Although there are no documentary records of Sutton in 1150, it is possible to work out what Sutton was like then from later events - for example, some charters of the fourteenth century record the sale of strips in Sutton Fields, but the precise location of the open fields is not given. The glebe land may have been part of one of the fields. The glebe land was given by the lord of the manor, probably the first Beauchamp to become Earl, William de Beauchamp, who became Earl of Warwick in 1267. He is said to have been powerful and energetic, and keen to develop his manors to the best advantage. How far he was responsible for re-organising his manor of Sutton Coldfield is not known, but it does seem likely that the parish church was built in his time, and a Rector appointed. Previously the chaplain at the Manor House had filled the role of parish priest. The Rector was provided with sixty acres of land, known as glebe land. The Rector’s sixty acres were existing farmland, probably half of one of the open fields (that is, he received the rents); by 1600 the glebe land was consolidated into a number of smaller fields, comprising what is now most of Rectory Park, the cemetery, and the Lichfield Park estate. School Farm was probably another of the open fields. In 1541 Bishop Vesey founded a school in Sutton which was endowed with a grant of land - this produced an income sufficient for the school governors to employ a master and manage the school. The school building was near the church, but the school land, 120 acres, lay between Lichfield Road and Whitehouse Common, occupying the site of another of the open fields of medieval Great Sutton. This accounts for two of the 1150 open fields, one centred on the School Farm estate and the other at Rectory Park. If there was a third open field, it either lay between High Street and Sutton Park, or perhaps it straddled Lichfield Road, being separated from the other two fields by meadowland in the bottom of the valley. Like a good deal of our local history, this is speculative, perhaps to be proved wrong if and when new evidence comes to light.